The Hampton Inn Mebane hotel is conveniently located just off Exit 153 on Highway 85/Highway 40 in Mebane North Carolina. 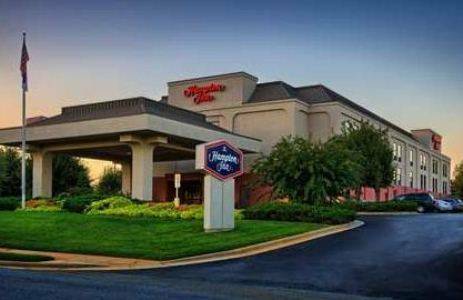 The Hampton Inn Mebane hotel is convenient to many local businesses attractions and restaurants such as Alamance Community College the Arrowhead Golf Course the Burlington Manufacturing Outlet Cracker Barrel and Country Kitchen. The Hampton Inn Mebane hotel features in-room coffeemaker hair dryer micro/fridge 2-line speakerphone TV with cable and complimentary wireless internet. This Mebane North Carolina Hampton Inn hotel also offers whirlpool suites voicemail On Demand movies audio/visual equipment connecting rooms cribs and an exercise gym. . Guests of this Mebane North Carolina Hampton Inn hotel will also enjoy the complimentary On the House hot breakfast and the On the Run breakfast bags /available Monday-Friday/. We love having you here at the Hampton Inn Mebane hotel in Mebane North Carolina. - Alamance Regional Med. Ctr. - Safe Way Sprinkler Co. Inc.
- United Sprinkler Co Inc. Unexpected and unsettling is this museum's giant talking farmer robot. Town landmark, once called the "Bureau of Information." 38 feet tall, with two giant socks hanging from one of its drawers. A TV Land tribute to characters from the 1960s Andy Griffith Show. Griffith's home town of Mt. Airy has a duplicate of the statue. A historic roadside symbol, older than any other big pot in America.